I’ve been thinking a lot this week about food. Wait, what? Me think about food? Never. Did I mention it’s my favorite time of the month so along with back aches, chocolate is the only food group I want to shove in my face? Anyways, I had a pretty indulgent month of August which is funny because it started with the very 1st day of last month when my magazine article came out. John and I celebrated, with food, all weekend and it became a slippery slope that was pretty ironic considering my article was about LOSING WEIGHT. But I’m also a success story who has managed to keep all but about 15 pounds off for 3 years. Part of maintenance is fluctuating, and it’s taken me a long time to accept that. The choices I make on a daily basis are part of who I am now, and they are choices that I feel anywhere from 80-90% confident that I make well. Sometimes you have a few weeks where the not as great choices outweighed the good, but knowing when to clean up your act is the key to having real balance. With 8 more races in the next 3 months, I know that nutrition is one of the biggest factors in helping me achieve my goals along with proper training. Tack on my full-time job and my full-time school load and I really have to be on top of what I’m putting in my body to have the most energy. So this week it’s about getting back to the basics. No “detoxes” and no grueling 3 hour workouts to try and erase the month of August. That mindset is not healthy no matter who may be writing about it. 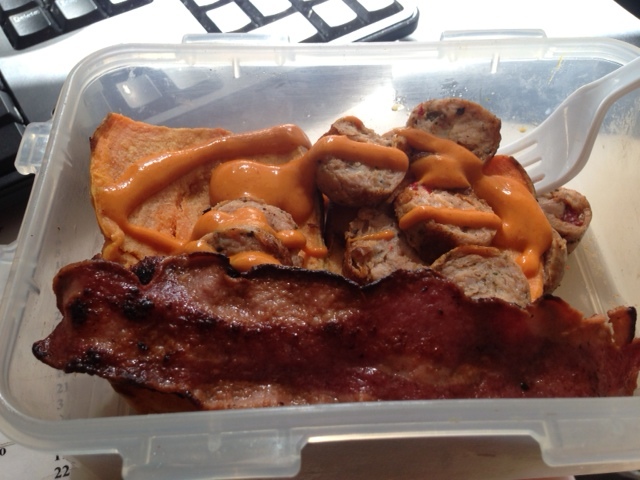 The basics for me is really taking the time to food prep so that I have my own lunch and snacks with me at work. The basket of pastries at work are always going to be tempting, but I’m also pretty cheap (read: broke) so knowing that I already have food that I paid for with me is a big incentive to not fill up on calorie-dense foods. 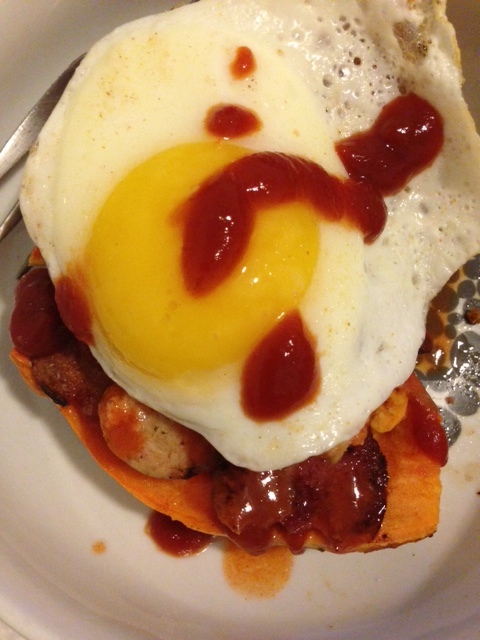 This is one of the reasons tracking my calories and macro-nutrients daily helps keep me accountable. Even with my indulgences through August, I stayed within my maintenance calories and don’t feel like I’ve really gained anything. I love being able to fit in whatever I want to eat by tracking it ahead of time. I can stretch 1700-1800 calories into a looooot of food. Here’s a few things I’ve eaten this week. 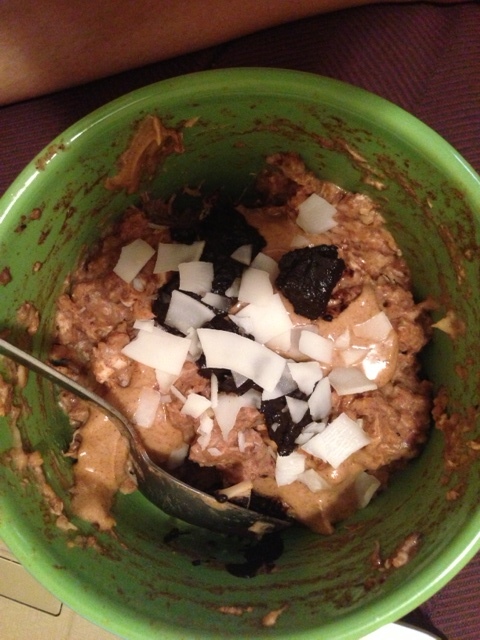 banana chia oats topped with vanilla almond butter, roasted coconut chips and homemade dark chocolate. Almond joy oats! My FAVORITE dinner right now. This dinner is note worthy. 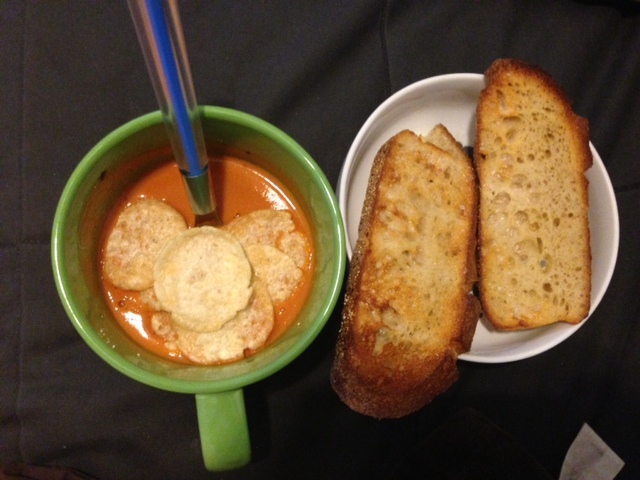 Trader Joe’s roasted red pepper and tomato soup is the best soup I’ve ever had in my entire life. 1 cup is 100 calories and is more than enough! I add garlic powder and crushed red pepper, microwave for 2 minutes and eat it with some popped chips (healthier than oyster crackers!) along with the BEST bread I’ve also ever had. Trader Joe’s tuscan pane bread, 120 calories a slice and they are big, which I spray with coconut oil spray and throw in the oven at 400 degrees for 5 minutes or so then add garlic powder to. This will be my go-to dinner for the next 6 months. So easy and so cheap! 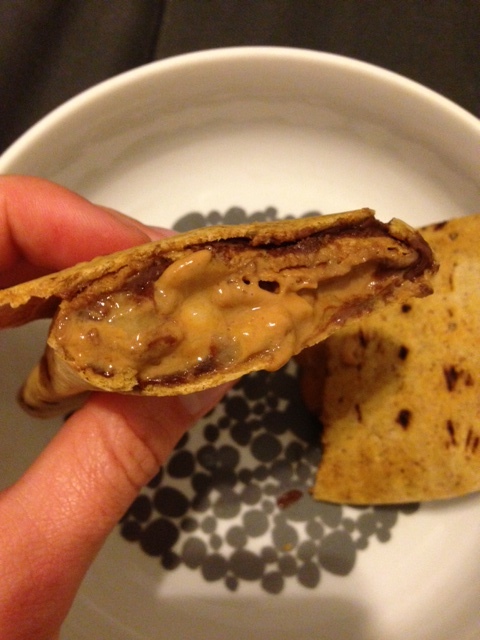 Light flatout wrap with dark chocolate pb, Better’n PB & mashed banana folded and heated on the oven. 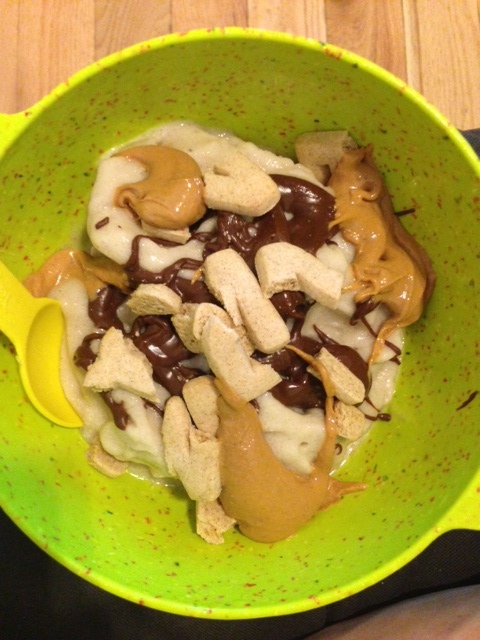 Great snack or dessert! Last night John and I went to a new restaurant in our neighborhood that was REALLY nice, especially for our ‘hood. It’s a big tavern that had a lot of energy for a Wednesday night! I really wanted a little dessert after, so I got a nice big salad for balance. TERRIBLE lighting and I should have used my flash. 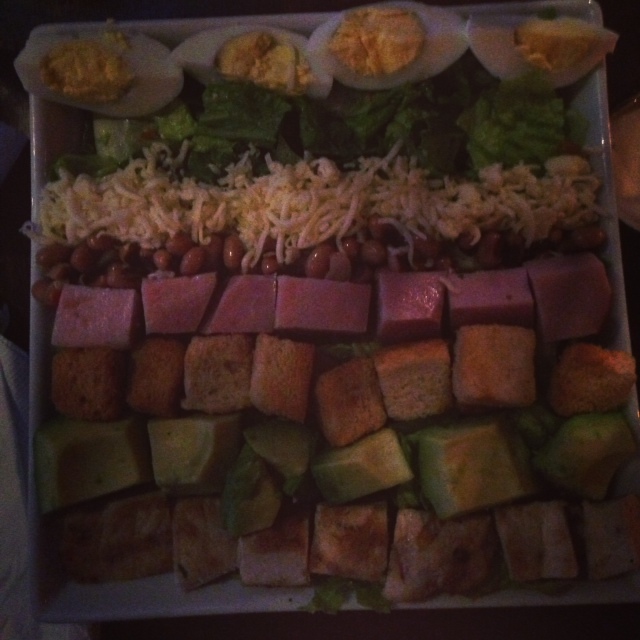 But it was a southwestern cobb salad which I removed the fried green tomatoes from and took out the yolk of the eggs to save some calories. I ended up using their homemade hot sauce as my dressing and couldn’t finish the whole thing which means it was HUGE. I seriously can eat a lot of food in one sitting, so this was notably huge. 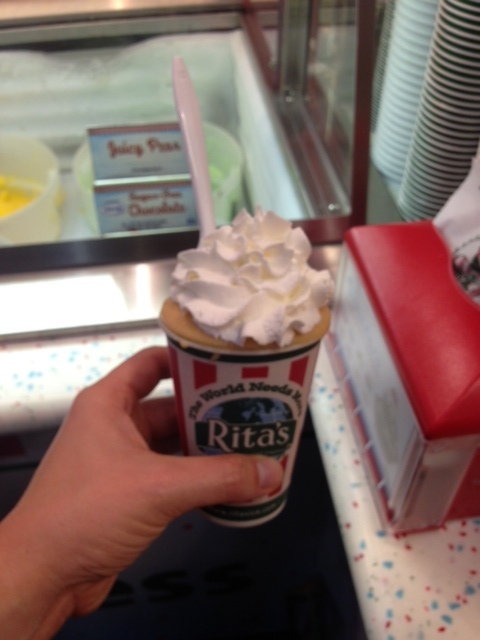 I had to save room for what I was really craving which was a pumpkin cheesecake italian ice! What are your ways of “cleaning up your act” after indulgent eating?